When I was about 11 my mom taught my sister and I to crochet. For a few weeks we made lots of “garlands” (long chains of chain stitched yarn) before learning a stitch pattern to make blankets and other things. I’m still working on that first blanket that I started 15 years ago. My sister, on the other hand, took off running with the idea and has become really good at crocheting! In the meantime she has made more baby blankets than I could ever count, and branched out to scarves, ornaments, stockings etc.! She’s pretty good at just deciding what she wants to make and then coming up with a way to make it. Case in point, on Saturday she was up here with her whole stock of goods. The next morning I noticed that she had posted online some headbands which I’d never seen her make before. She’d decided she wanted to make something new and just went for it. She already had 3 or 4 that she’d made in less than 24 hours! If you haven’t finished your Christmas shopping yet I recommend checking out her website (yes I made it, but it’s not my best work, it was what I could put together in a Saturday afternoon while watching kids – don’t judge me!) Her Christmas ornaments and stockings would make really fun and unique gifts, and her scarves are really soft and look great too! Also, right now she’s hosting a giveaway on her blog. You definitely want to get in on this since there are only 6 entries as I write this, and the winner gets $50 of her merchandise for free! You wouldn’t get the prize in time for Christmas, but you’d be ready for next Christmas, or you could have her crochet you something custom-made! Anyways, check it out, the giveaway ends on Dec 23rd! I started this post just after Thanksgiving while it was all fresh in my head, and I’m not sure why it never got completed before now, I was only about 4 sentences from finishing. Oh well, here’s our Thanksgiving post. Every year we try to swap which family we’re with for Thanksgiving and Christmas. So one year we’ll do Thanksgiving with the Hansens and Christmas with the Andersons, and then the next year we switch. The Christmas we were engaged Eric came out to California to meet my family, so the next year we decided it was only fair that we went out to Indiana to spend Christmas with his family. We figured this was the best way to keep it from seeming like we were playing favorites with one family or the other. What was interesting to me was how surprised people were when I told them we were going to spend our first Christmas with Eric’s family rather than mine. Apparently most girls will demand to spend Christmas with their own family, which seemed like such a strange concept to me that I never considered it. Each of our families is very important to us, so why would we want to leave one of them out? But I digress. So, this year was supposed to be a Hansen year for Thanksgiving and an Anderson year for Christmas. We were making plans accordingly when my mom told me they were thinking about coming up to Utah for Thanksgiving. I was excited that they’d be coming up… but it was a Hansen year for Thanksgiving. Even though we live with Eric’s parents I still wanted to make sure we were being fair with everyone, so I told my mom that we’d obviously try to see them as much as possible while they were here, but this year we were sorta committed to spending Thanksgiving with the Hansens. When I told Dad Hansen about this predicament he told me that he and Mom Hansen were going to be in Illinois over Thanksgiving watching Eric’s brother’s kids anyways. That made things very easy, we just switched which holiday we were doing with which family this year and everyone was happy! In fact, it even worked out better because with our house closing at the end of December it was going to be stressful trying to travel back and forth to California at the same time. My family was planning to drive up here on the Tuesday before Thanksgiving. So a few days before my family was planning on coming up my mom starts noticing that the weather patterns aren’t looking especially conducive to traveling (for those of you who don’t know, my mom is a meteorologist). The closer they got to leaving, the worse the weather looked. In fact, from the way the storm looked it was set up to possibly create one of the biggest snowstorms Utah had seen in a very long time. In fact, I looked at the weather maps as well (as much as I can understand them) and encouraged Eric to come home from work as early as possible on Tuesday and try to reschedule his meetings so he could work from home on Wednesday. I also stocked up the 72 hour kit in our car and sent Eric with a sleeping bag, pillow and our Kindle, just in case. As the time for my family to leave came close they decided they ought to just wait the storm out in sunny California and see what the damage was after the storm had passed. I was very relieved to know that they weren’t going to be driving in that storm and just focused on waiting for Eric to get home safe and sound. The original predictions for when the storm would hit were pushed back a couple of hours so Eric stayed a little bit later at the office to really finish off his work for the day before coming home. That, of course, made me nervous but eventually he did make it home safe and sound before the snow started to fall. 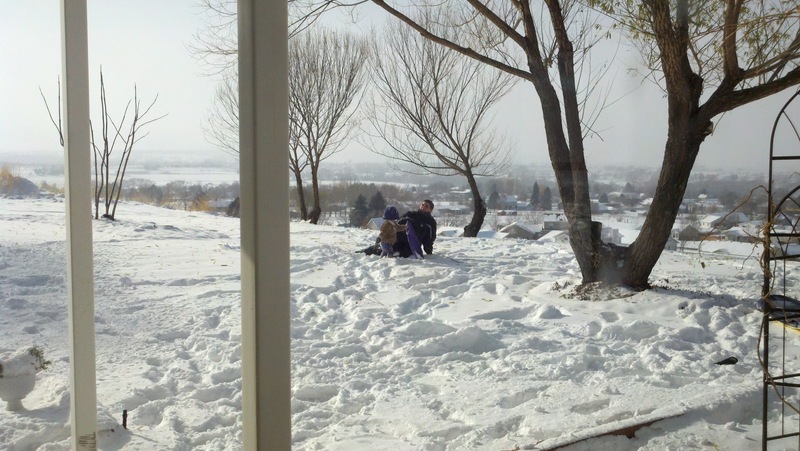 Then we hunkered down to watch “Snowpocalypse”. After a little while the snow started to fall. I opened up the blinds in the front room so Sam could watch the snow falling, and he thought it was pretty awesome. We went about doing the things we had intended that evening while keeping an eye on this storm. Then, after a couple hours, the snow stopped. We thought we were just in a break in the storm, but it never picked back up again. That was it, “Snowpocalypse” was over. We did get a fair amount of snow and it definitely wouldn’t have been good to be out on the roads while the snow was falling and until the roads were cleared off. But it definitely wasn’t the epic storm it was supposed to be. However, I still don’t feel dumb for making the preparations that we did or that my family waited to come up. Especially if you look at what that storm did further north, there was every reason to think it was going to be pretty bad here in Utah as well. I’m glad that we didn’t have the massive storm that was predicted, but I’m also glad that we were prepared in case we did. Anyways, my family finally came up on Wednesday. They drove all day long and luckily by the time they hit Utah the roads had been pretty well cleared so they made it to Provo without incident. They had to stop in Provo so that my little brother Cody could go on a “polyga-date” with a couple of the girls he’d met at EFY and then they made it up to my in-laws place where we’re staying now. We ate dinner together and then quickly packed up to go to my grandparents house in Logan. We arrived in Logan pretty late. By the time we got there it was time to put on pajamas and hop into bed. Thanksgiving morning was spent preparing food and just spending time with family. 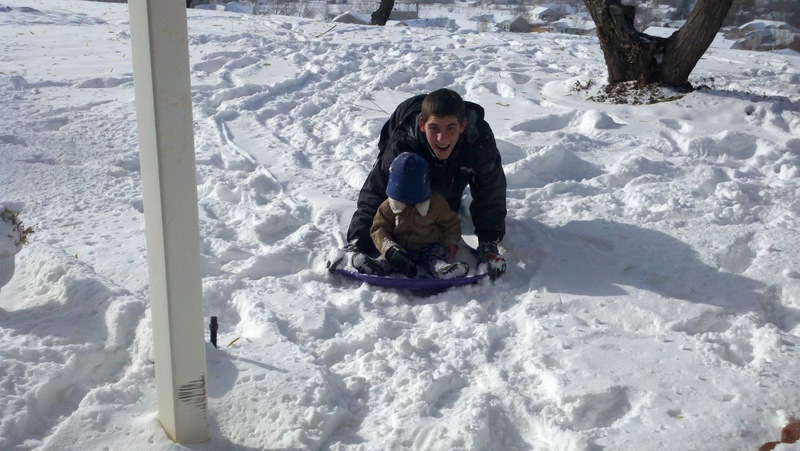 Sam was really excited about the snow and wanted to go outside with the bigger kids. Unfortunately, despite my Uncle Paul giving us a snowsuit for Sam just a few weeks before I had neglected to bring it with us up to Logan. I had been operating on the philosophy that it was way too cold to go outside (it was only 2 degrees!) and had forgotten that little boys might feel otherwise. So after much begging I found the closest thing to snow clothes that we had for Sam – his pajamas, warm coat (but not waterproof), and sneakers. 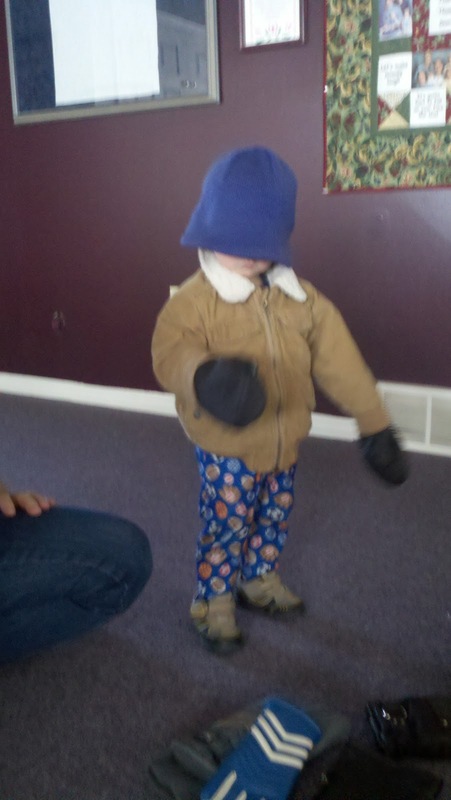 Then we borrowed a beanie and gloves that were way too big for Sam and sent him out. Evidently Sam enjoys the snow. In fact, it’s all he’s been talking about ever since we started getting snow here. He will pull me to the window a few times a day and say “Look! Snow!” It’s a good thing because we’re going to be living where we’ll get a lot of it. You probably can’t see in the picture, but towards the end Sam took off one of his gloves. He was mad that he couldn’t touch the snow so he got the glove off and touched the snow. That was all fine and dandy, until we got him inside. The cold hadn’t bothered him so much, but warming that hand back up really did. Poor kid, it wasn’t anywhere near frostbitten or anything like that, but when you don’t know that the pain is going to stop and your hand will feel warm again it’s pretty scary to go through that. We’ll have to do a better job of securing his gloves in the future. After all the fun in the snow it was time for the delicious Thanksgiving meal. My grandma had opted to do the whole meal on paper plates this year, which I think was absolutely brilliant! Why have dishes for 30 people when you can just throw it away and be done?! The food was delicious and it was fun to be with family to enjoy it. Sam didn’t eat too much but he enjoyed some of the rolls and corn, not exactly a Thanksgiving feast on his part, but he was happy so who cares? After we cleaned up the meal we played games and watched TV. I laid down on the couch to just rest for a few minutes… and woke up three hours later. Oops! Apparently I needed some sleep. It wasn’t even a quiet place to sleep, I was right in the middle of where people were playing games and doing stuff. The boys set up a Mario Kart Wii tournament in the evening. Eric came in second despite wearing his lucky Mario Kart t-shirt. After a few more games it was time for us to head back to South Jordan. My brother Jayson had a flight to catch the next morning and we decided it would make the most sense for Eric and I to just take him home with us and then take him to the airport the next morning. Particularly because Sears was having an incredible Black Friday deal on a washer and dryer set that we actually thought it might be worthwhile to wake up early for, even though we hadn’t gotten back until after midnight. We since there was no way we were taking Sam Black Friday shopping we would divide and conquer. Eric would wake up at 3:30am to be at Sears to try and get the washer and dryer and I would sleep with Sam and get Jayson to the airport by 9am. We had the deal that Eric was allowed to sleep through as much of the rest of the day as he deemed necessary in return for braving the Black Friday crowds. Well, we didn’t get the washer and dryer that was ridiculously priced, but Eric still managed to get the very best deal I’ve seen on a steam washer and dryer. In the end I’m happier that we didn’t get the “doorbuster” set because it didn’t really have the features I wanted, it was just at a price that we couldn’t pass up. The set that Eric got us instead are way better and he still saved over $1000, so a successful day overall. On Friday my parents came back down to South Jordan and my sister Taylor and her husband Ryan and son Skylar returned from their Thanksgiving in New York. Since Mom & Dad Hansen were out of town they had graciously offered that everyone could stay at their house, so the whole family stayed here and played games that night. We also did our traditional Chinese meal that Eric puts together whenever my family is in town (it’s by special request now, he does a great job). We made fried rice, dan bings and potstickers – yum! The food was great and we had a great time together. It was really fun just being our own family for a little while and enjoying each others company. On Saturday we got to take my family up to our new house and finally get to show them how it’s coming along and where it is. It was fun to finally be able to show them physically what we’ve been describing to them for awhile. Then we continued on to Provo to watch the BYU vs U of U game. For those of you who may not know, there is a HUGE rivalry between the two schools, and that rivalry is extended into my family. Eric and I obviously both graduated from BYU, Taylor & Ryan are currently students there, and Cody is working on getting ready to apply to BYU to attend in 2012. On the other hand my parents met at the U of U and are die hard fans (well, at least my dad is die hard, my mom is definitely a fan, but probably not as adamantly so). So we all gathered with Brick Oven Pizza for what was sure to be an exciting game. It really was an exciting game, it came down to the last few seconds of the game, and the U of U won despite not having scored a single point in the first 3 quarters of the game. It was fun to watch even in light of the disappointing ending. Afterwards the girls went to a bridal shower for a good family friend and the boys went to the gym to play raquetball. The quote of the evening came from my brother Kyle who, when my dad asked him how he liked the biggest Gold’s Gym, he replied – “They had the buffest midget ever!” Apparently Eric and Ryan knew exactly who he was talking about, but it was still a pretty unexpected response. On Sunday Taylor and Ryan had their baby blessing for Skylar. We had a fun luncheon at the Lockwoods apartment before church (their church doesn’t start until 1:30pm). Taylor and my mom made some yummy soups and bread, and Mom Hansen was able to rescue dessert by having left a frozen cheesecake that she had asked us to eat while she was gone. The blessing was a great event to be able to participate in. It was really neat to see this little baby who had struggled to get into this world, now receiving his baby blessing and you wouldn’t have known he had ever had those struggles. There was (of course) another huge snowstorm coming in that afternoon so my family was anxious to get on the road before it hit too badly. They had a pretty treacherous journey back and we kept getting text messages like “Almost through filmore. We definitely won’t be doing this trip in any record time, a few minutes ago the truck we were following did a 360 and slid off the road. Why do you guys live in Utah?” and “By the way we keep seeing 4 wheel drives off the road” and finally “We are to Vegas and we are still finding chunks of ice that have fallen off cars”. They did make it home safely and we got back to normal life. I know, I know I still owe posts about Christmas and our new house. But I was just cleaning off the pictures from my phone and wanted to get these pictures posted while I still remembered what they were. I promise pictures of the new house will be coming soon! A couple weeks ago Eric was getting ready to go on a business trip to Los Angeles. 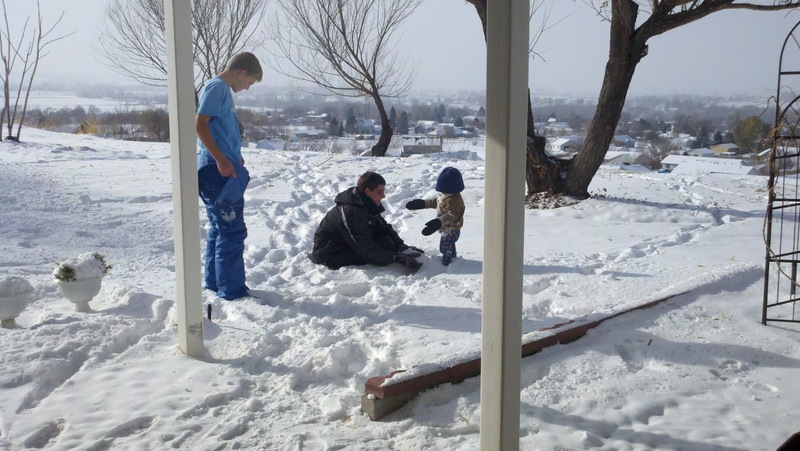 I was of course jealous because he’d get to go see my family while he was there while I’d be stuck in the snow by myself. So on Sunday before he left we were Skyping with my family and my parents offered to use some of their frequent flier miles to fly Sam and I up with Eric for the week! We didn’t really have a good reason not to, so we booked the tickets on Monday and we flew out Tuesday night. It was so fun to get to spend some time with my family that week. We didn’t really do anything earth-shatteringly awesome, but it was fun spending time with them. I think it was an especially nice break for me. This pregnancy has been more rough on my body than Sam’s was. I think mainly because it takes a LOT more energy, time and strength to be a mom of a toddler than it did to work 40 hours a week – commute and housework included! With our move I’d pushed myself a little too far with running things up and downstairs and lifting things I shouldn’t have and I’d developed what I think were shin splints. At any rate I was having a very difficult time getting down to the floor without serious pain in my shins. Just having a week where I couldn’t do anymore unpacking and there were many anxious hands to help care for Sam got me back to ready to face the rest of settling into our house. (I feel like this sounds bratty and spoiled, but I definitely feel like I was spoiled for a week so I guess that’s ok). Our trip wasn’t full of lots of exciting activities, mostly attending high school basketball games, swimming, being outdoors and playing a lot of Dominion. But it was fun spending the time with family. I think the most interesting thing to see was just the change in Sam from when were in California a year ago and now. When we were out last year Sam would hardly have anything to do with most of my family. He is a very clingy child and has had a lot of separation anxiety. But now he quite happily will tag along with any of my brothers or my parents and is very excited to see them. As you can see we didn’t even make it out of our pajamas a good portion of the time. 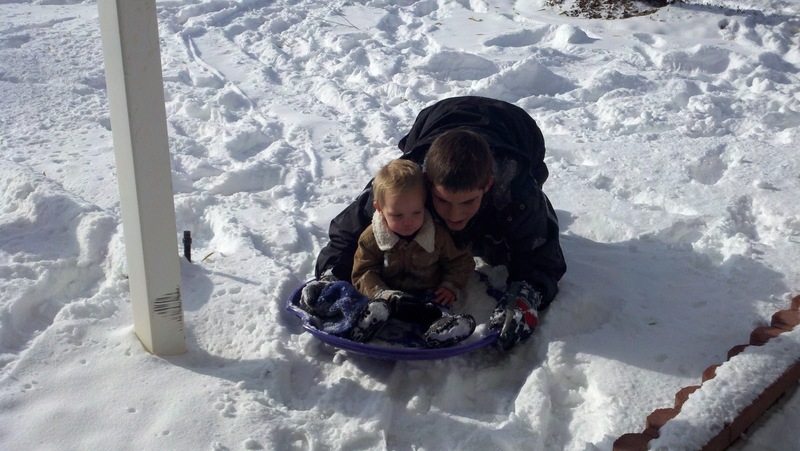 This is Sam with his Uncle Cody playing at a common area at the end of my parents street. I don’t think Sam much minded that they were still in their PJs, he was just stoked that Cody was paying attention to him and that he was playing outside. On Monday before we left we went to the beach. Not surprisingly, Sam *loved* it! A better look at Sam in my mom’s hat. I love this shirt, it says “I do all my own stunts” which I think is brilliant for a toddler. He most certainly does a lot of stunts, and they are all his own. I was really excited when I found this shirt in a bag of hand-me-downs and had a hard time waiting until he was old enough to wear it! Sam also got to boogie board down the sand dune. He’d lay on the boogie board and Cody would pull him up and down the sand dune. Sam thought that was pretty darn cool, as you can tell from the smile on his face (sorry these weren’t the best pictures, it was really bright that day and the only camera I had was my phone. I couldn’t see the screen because it was so bright so I just had to aim my phone in the direction of what I wanted a picture of and hope that it turned out ok). We had some fun gifts that we gave and received. We bought a few movies for Taylor and Ryan to enjoy together (my family rotates so that each sibling buys for just one other sibling – Eric and I had Taylor and Ryan this year), and a webcam for my parents (of course, my dad also bought one for my mom, which at least confirmed that it was a good idea…). We also got a calendar for my dad that has funny grandparent stories (I’m not sure how it started but I’ve bought a day-to-day desk calendar for my dad every year for the past several years. I like it because he keeps it at work and will tear off a page every day and think of me, and it’s something he uses), and a book called Funny, You Don’t Look Like a Grandmother for my mom. Since Samuel will be their first grandchild it was fun to get them some grandparent gifts. We got a lot of baby stuff — my mom even put together a stocking for Samuel! We also got a stroller from my parents for Christmas. There’s a really cool demonstration of all of the cool features of this stroller on the manufacturer’s website but unfortunately the makers of the site did the whole thing in flash (shudder) and so I can’t post a direct link to the demo here, but if you are interested you can go to the website and click on products, the on strollers and then select the Helio (it’s the second thumbnail from the right on the top) and then click on demonstration. 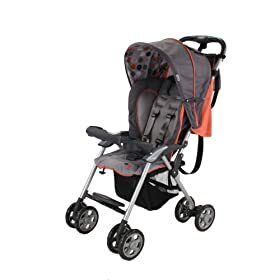 I really like how lightweight it is and how nice and small it folds up while still being a very functional full sized stroller. Thanks Mom & Dad! As Eric wrote about previously, we got the video camcorder from Mom & Dad Hansen in conjunction with Samuel’s imminent arrival :) We also received several cute outfits, baby towels and baby blankets from Eric’s brother Mike’s family and our sister-in-law Kristen’s family for Christmas. I’m really excited to start organizing everything and even more excited for Samuel to come now! Eric totally surprised me this year, which is quite the feat us! We both get too excited about our surprises for each other and usually end up sharing them beforehand. However, Eric managed to save some surprises for me. See, I lost my little bag that I keep my jewelry in when we moved from our apartment in Wymount to our friends’ apartment this summer. It had all of the jewelry in it that I wear regularly (which isn’t a lot, but they were the few pieces that I really liked). On Christmas Eve Eric went to the mall and bought me some new jewelry so that I have some nice things to dress up with! I never thought I’d be the kind of girl who was excited by little jewelry boxes under the Christmas tree but I was apparently wrong. He had picked out a couple of things that were simple and beautiful (just my style) and I was really touched by his sweet gifts. Thank you so much honey! He’d also bought me a pair of new headphones that are a lot nicer than the ones I’d normally buy for myself. They’re really good at blocking out sound and really comfortable too. I had to promise though not to put them in my purse since we think the magnetic buttons in my purse are what previously caused the demise of Eric’s headphones. I think those could have been a cool surpise, however I needed Eric’s help designing them since I don’t know how to write Chinese, and I would have hated for him to open up his presents on Christmas morning and have onesies that say something like “I love dog food” instead of “I love my daddy”. I made two for him, in different sizes so that he’ll be able to have Samuel wear them for more than a couple of months. I was surprised that I was able to do it for a pretty reasonable price at MakeAOnsie.com. Active Andersons: Part 2 – Christmas! So, I’ll give you a rundown on what we did during our time there. My family waited to get a Christmas tree until the last minute (we like doing live trees, but we’re all allergic, so it’s best if we have a tree in our house for as short a time as possible) so we got to decorate it our first night home. We stayed up pretty late playing games and hanging out with family but it was worth it. We slept in on Christmas Eve to recover from our long trip and late night, then spent most of that afternoon finishing up Christmas shopping. Christmas Eve is when my family does most of their Christmas traditions. We had our big Christmas dinner at our house with another family who had been very helpful to in organizing the Yes on Prop 8 campaign. After they had left we did what has always been my favorite family tradition – Christmas pajamas! Every year we each get a new pair of pajamas that we wear Christmas Eve and all day on Christmas (although this year we modified the tradition to be something to wear on Christmas – mostly sweats for the girls, basketball shorts and t-shirts for the boys, and Cody opted for a new pair of jeans and a hoodie :P). We hide the pajamas throughout the house and then everyone has to search to find their pajamas. This year Taylor helped hide the pajamas so they were hidden a little bit more creatively than usual. Cody’s ended up in a popcorn tin… in the garage… in the attic. I found mine in the outside refrigerator (good thing pregnancy has made me warmer than usual or I’d have been pretty put out to have cold PJs!!). My dad’s were in the solar oven – ok, so the solar oven was my mom’s doing, but you get the idea. Once everyone had their PJs on we read Luke 2 together. The rest of the evening was pretty laid back as we wrapped presents to go under the tree and played games. Once most of the younger kids had gone to bed (not that any of them are really young per se, I just mean the kids younger than me) we stuffed stockings and put them out before going to bed ourselves. Christmas morning we were all woken up early because my youngest brother Kyle (10) is still at an age where seeing what Santa brought you is far more exciting than sleeping in. I think Christmas is just more fun when you have little kids around, and it made me even more excited that we’ll have our Samuel here next Christmas, even though he’ll probably still be a little young to truly get caught up in the excitement.